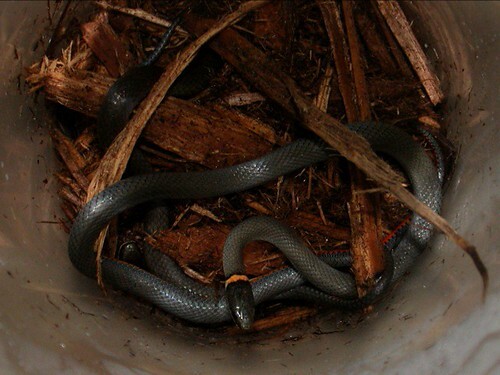 The Ringneck Diary began as a project to document our attempts to keep Southern Ring-necked Snakes (Diadophis punctatus punctatus) in captivity. After a few days, though, I stopped writing new entries: the snakes had been established, and were eating, and there was little more (it seemed) for me to report. Things became routine. “Keep watching this page” was the last thing I wrote. Then they began to die, one after the other. Jeff’s lasted longer than Florence’s or ours, which expired after a month or so. Life interfered to prevent me from writing a coherent summing-up entry at the time. Our last ringneck died after being moved into a five-gallon cage, and at the time I surmised that the stress of change, and of handling, did it in. In each of the cases I observed, skin blisters appeared shortly before each of them snuffed it. These were wild-caught snakes housed collectively in a pet store, so they were not likely in the greatest of shape to start with. The pet trade is not kind to delicate species, and my experience leads me to recommend against keeping Diadophis in captivity unless you’ve got a good reason to do so, and know what you’re doing. In any event, here are the entries I made back in June 2003. Picking a perfect punctatus—or, what’s with all the blisters? Feed them worms — but how? Last updated: November 30, 2010. Of all the varieties of snake that are indigenous to eastern Canada, the Northern Ring-necked Snake (Diadophis punctatus edwardsii) was the one taxa I was certain that I would never keep. They were delicate, unhandleable, hard to find, and only wanted to eat Northern Red-backed Salamanders (Plethodon cinereus). As a result, I never expected to find myself in the situation I’m in now: with two ringnecks housed atop our dresser, and another two housed chez Florence. What happened is that these are Southern Ring-necked Snakes (Diadophis punctatus punctatus), which are not found in Canada. But they were found — at least by Jennifer, Florence and myself — in a Peterborough pet store called Animalia (no web site), which we dropped into for a peek last Friday while we were on our way to a weekend at Jeff and Jenny’s new property. We mentioned them to Jeff, who asked us to get one for him on the way back, and during the weekend we debated whether to get some for ourselves, in order to learn more about them and, like Jeff and Jenny, have them available for educational displays, substituting for the local subspecies. In the end, we got four of them: one for Jeff, one for Jenny and myself, one for Florence — and a spare, because we were wary of their durability in captivity. They will eat earthworms, which are easy to provide, instead of plethodontid salamanders, which are not. They look similar enough to northern ringnecks that they can pass for them at educational displays. They are not native to Quebec and therefore legal for me to keep, and while they can pass for northern ringnecks, they are distinguishable from them — an important consideration when you need to prove their non-indigenousness to wildlife officers! Southern ringnecks are smaller and have dark half-moon markings along their ventral scales; northern ringnecks’ bellies are patternless. To pick up from where I left off yesterday: we decided over the weekend to pick up a few of the southern ringnecks that Animalia had for sale. The question was, how many? Jeff asked us to pick one up for him so that he and Jenny could use it in their shows, and both Jennifer and I and Florence were interested in one. But it would depend on what we saw: C$30 was a lot to pay for a snake that sold for a couple of bucks from U.S. reptile dealers. Whether they were feeding, and their overall condition, would be the deciding factor. Picking out good ones was awfully difficult. Some had scars along their bodies, which is inevitable with small wild-caught snakes — Rough Green Snakes (Opheodrys aestivus) have them all the time, for example. But many had what looked to me like blisters along their bodies: puffy white areas, sometimes several on each snake. My first thought was that the cage was either too humid or not humid enough. Blister disease is common enough among captive natricine snakes (garter snakes or water snakes, for example) who are kept in too-humid conditions. Water snakes routinely get it when they’re kept, erroneously, in an aquatic setup. When I was a kid, I kept a Red-sided Garter Snake (Thamnophis sirtalis parietalis) in a poorly ventilated cage, and he got it, too. Aquatic snakes like Queen and Crayfish Snakes (Regina) or Rainbow and Mud Snakes (Farancia) break out in blisters if the water’s pH is off: they need to be kept in a tea solution to provide their skins with the necessary acidity. Treatment in each case involves using a topical antibiotic like Neosporin or Polysporin and changing the cage conditions. This is what I thought would be involved in this case. Except that, when I was reading up on their care when we got these snakes home, I found that the literature, scant as it is, makes no reference to blister disease being a problem in ringnecks, and, in fact, calls for them to be kept in a humid environment. It didn’t seem that humidity issues were to blame for the blisters. And then I came up with another possible explanation. They have a slightly toxic saliva and enlarged rear teeth, which might qualify them as rear-fanged snakes, depending on how you define the term — not that they could ever pose any harm to a human being. They are delicate and can’t be handled. Not that their skin would tear in your hands, as would be the case with some geckos — the issue is more their nervous disposition — but still. So here we had slightly venomous snakes with cannibalistic tendencies crowded in one cage. I decided that the blisters might actually be bite wounds: skin reactions to the bites of other ringnecks, inflicted during feedings. (They were fed worm pieces in the cage, and weren’t separated for feeding.) Not that I can prove it, but it’s as good a guess as any. If so, what we ended up buying were the snakes that had been bitten the least by their cagemates — probably not a bad thing in itself. In my next entry I’d like to say a bit about how to house ringnecks; in the meantime, here’s a photo of the snakes, in the deli cup we took them home in. Apart from a couple of pages tacked onto the end of a slim book by Philippe de Vosjoli on Rough Green Snakes (Opheodrys aestivus), the only real source of information on Ring-necked Snake care is the two-volume Snakes of the United States and Canada: Keeping them Healthy in Captivity by John and Roxanne Rossi (another edition is apparently coming soon). Lucky for me I have a copy (best $150 I ever spent), and when we brought the ringnecks home on Sunday night, I reached for the books immediately. Because the two volumes — the first on eastern species, the second on western species — were published three years apart (1992 and 1995, respectively), they don’t always agree (they learned a couple of things in the meantime), but they’re pretty consistent about ringnecks. A 10-gallon (20" × 10") aquarium. House individually to prevent food fights and cannibalism. Substrate: peat moss/soil mixture, one to two inches deep (though no more than one-quarter the length of the snake) with bark strips or flat stones on top to provide surface refuges. Mist occasionally, stir every few weeks, change every two to four months. Ventral heat not necessary, but UV lighting might not hurt. An incandescent bulb above the cage is recommended for providing heat, but it looks like ringnecks may prefer cooler temperatures. Branches might be used by the snakes for climbing and basking. Does well with potted plants and can be maintained in a naturalistic terrarium. Screen top recommended for good ventilation. Given the size of the Southern Ring-necked Snake (it’s one of the smaller subspecies), it seemed to me that a 5-gallon cage would be appropriate. Unfortunately none of us had any spare 5-gallon cages, though we’ll probably free some up after I sell a few more garter snakes. In the meantime, we had to come up with something in which they could pass their time in quarantine. The cages are 1.7-litre Rubbermaid containers. 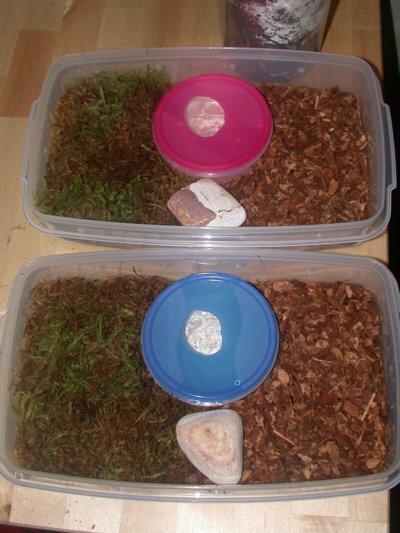 At one end I put moistened sphagnum moss, and at the other, bark nuggets, to provide a moisture gradient. (Florence, who didn’t have any sphagnum, used cypress mulch, which she had and I didn’t.) A covered water dish and stone bisect the two zones. It’s not a perfect setup. Ventilation could probably be better; these Rubbermaids retain moisture pretty well. But it should be okay for the next few weeks, until I can free up a better cage. It’s certainly better for them than the standard captive snake setup of paper with hidebox and water dish. In my next entry, I’ll share our attempts to get these snakes to eat for the first time. Feeding ringnecks is one of those areas where subspecies really matters. My impression is that ringnecks eat earthworms in the southeast and central plains, other snakes in the southwest, and salamanders in the northeast and on the Pacific coast. I might be wrong there; I’ll check again when I look into the different subspecies in a future entry. The fact that Southern Ring-necked Snakes will eat earthworms is why they’re in our care in the first place: it makes them easy to provide food for, as I mentioned in the first entry. But offering them the right food is one thing; offering it in the right way is another. Do we stimulate their appetite through tease-feeding, or do we give them as much privacy as possible? I attempted to feed my two ringnecks today. I was going to give them half a nightcrawler each, cut up in four pieces, placed in the dish that I would leave in their cages. I proceeded around 5:00 PM. The first one was out when I opened the cage. It started flicking its tongue very rapidly. I placed the dish in its cage and put it back on the shelf. Intrigued by the quick flicking rate, I thought I’d try tease-feeding the second ringneck. I had to push in from under the substrate, just so I could see its face (at that point, I thought the snake would be too stressed to eat). I proceeded with the tease-feeding: same quick flicking rate as the other one. I tease-fed it for about 30 seconds, pushing the worm piece against its snout, and it ate. Woohoo! I’ve just checked the two cages again, about an hour later. The snake that was tease-fed has eaten all four worm pieces. The other one has gone underground. I’d be tempted to tease-feed the second one. But I’m going to wait to see whether both approaches work. As I told you via MSN last night, #2 had just eaten three worm pieces when I checked (around 8:00 PM). I disturbed it by opening the cage and it didn’t eat the other one before I went to bed. I’ve just checked the cage again. It ate the last piece overnight. The snake was out when I opened the lid. It flicked and seemed to wonder whether I was bringing more food. So far, I find them to be curious little animals. Granted they will be secretive too. But if they’re out, or you try to get their attention, their reaction tends to be garterlike. They raise their heads, flick their tongue, as if to say, “anything interesting coming?” I’m enjoying them so far. At our end, we simply left the food — cut up in the same manner — in their cages. One of them ate two of four pieces right away; a day later, that hadn’t changed — the second snake hadn’t eaten. As this writing, there has been no change — we’ve removed the worm pieces from their cages so that they don’t get too stinky. They’re still “perky and active,” as Jen puts it, though. It’s hard to say yet whether the difference in feeding response is individual or whether we need to get their attention. My experience with young garter snakes suggests that they may be more willing to take small, whole, live earthworms instead of chopped-up pieces of giant nightcrawler: some garters would take pieces, but others needed small whole worms. We’ll see — and, of course, we’ll keep you posted. Keep watching this page.